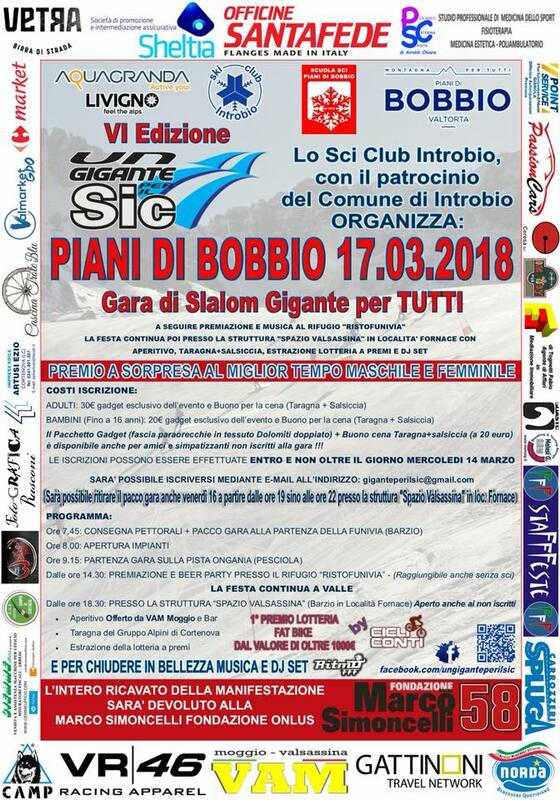 Here we are again guys, we have The wonderful second big event of the year of the foundation, The Giant For Sic that closes the winter season in Piani di Bobbio (LC). Bring your competion if you are a skier or if not, come and party with our group and join us. We stay together from early morning until late evening. The slalom starts at 9 am on the tracks, to continue to Bar Ristofunivia, we dinner and we dance at Spazio Valsassina in Barzio until 2pm. We are many and united with the sole purpose to remember a friend with big curly hair who in his name and with your help is financing an wonderful daily center for disabled children in Coriano will be inaugurated within this year! Also donhors, it is time to renew the Sic Supporter card 2018 if you haven’t done not yet, with a donation start from 58€ the tshirt is free!